There is shopping until 12:30 when we will begin lunch and hear from our two speakers. And then we will continue with shopping until 3. This is NOT just a shopping experience. We really want to have an exciting day, learn about what has happened in Frankfort (if anyone knows, it will be Senator Raque-Adams! ), and hear from a former Cabinet Secretary and current candidate to DEFEAT Yarmouth….. Please plan on joining us for this fun afternoon. Vickie Glisson is a nationally recognized attorney with 30 years of health care and health insurance experience. Governor Bevin appointed her in 2015 as Secretary of the Cabinet for Health and Family Services. As Secretary, she led efforts to reform the child welfare system, work to establish family drug courts, and save Kentucky over $30 million in reforms and efficiencies. She recently resigned her position to run for the United States Congress in Kentucky’s 3rd District. When elected, she will replace the only Democrat remaining in Kentucky’s Congressional delegation. She is married to Col. Shawn D. Glisson, MD (USA, Retired). Senator Julie Racque Adams represents District 36 in the Kentucky Senate, where she is one of only two Republican women. Prior to her election to the Senate, she served as a member of the House and of Louisville’s Metro Council. In the Senate, she chairs the Health and Welfare Committee. 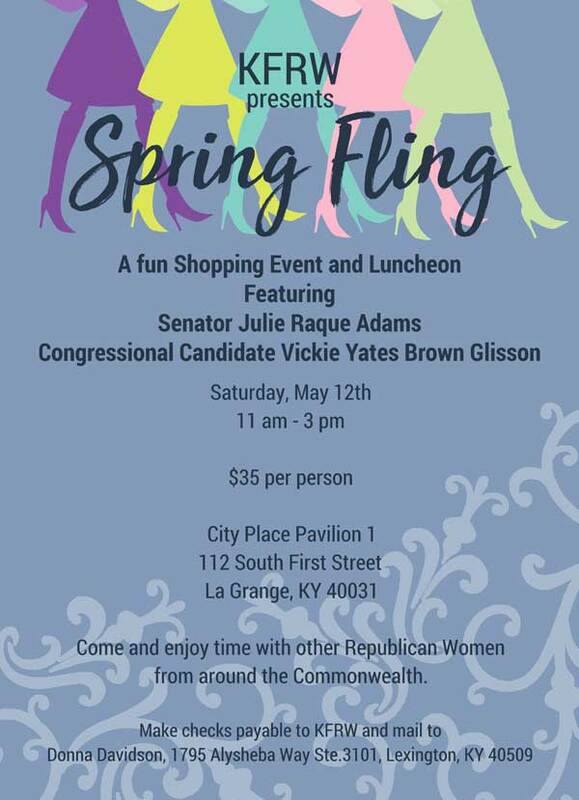 Adams is also the founder of Kentucky Strong, a group established to recruit and encourage female Republican candidates. Her recently passed SB 48 tightens Kentucky’s child marriage laws. She has sponsored and co-sponsored many other important pieces of legislation.